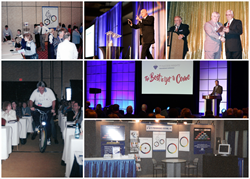 TTI Success Insights is celebrating its 30th year of TTISICON, an annual talent management conference in Phoenix. Debuting in 1990 with just 29 attendees and future President Rick Bowers serving as bartender, TTISICON has become the go-to event for members of the talent management industry looking for ways to gain insights, connect with like-minded peers, become inspired and maximize the potential of an organization’s workforce. The event takes place on Friday, Jan. 11, 2019 at the JW Marriott Desert Ridge. Keynote speakers and industry thought leaders such as Frans Johansson, Molly Fletcher, Brian Mohr and Ron Price will share the stage with members of TTI Success Insights’ leadership team including Rick and Ashley Bowers, Candice Frazer and founder David Bonnstetter. Together the speakers create a story arc meant to transform the way organizations think about success - through people. To register and learn more about the event, visit ttisicon.com. TTI Success Insights reveals human potential by expanding the awareness of self, others and organizations. Diving deeper than DISC, TTI SI provides professionals solutions to hire, engage and develop the right people and build strong teams. To learn more, visit ttisuccessinsights.com.